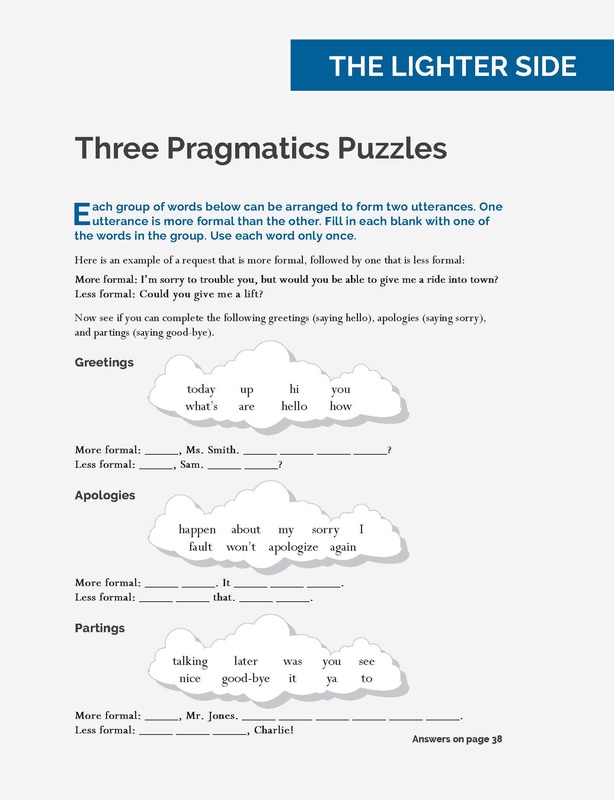 Read about pragmatics, learn tips for publishing, and use the latest “Try This” activity in your classroom. All of this and more can be found in the newest English Teaching Forum. When Taro’s name was called, he stepped away from the tired and disoriented group of Japanese students who had just completed the long flight from Tokyo to Toronto and a bus ride to the University reception where they would meet their Canadian host families. His host mother walked right up to him and gave him a hug. Taro stood with his arms at his sides looking uncomfortable, if not alarmed. He did not know how to react. Japanese do not touch during an initial greeting.When his host mother ended the hug, he gave a nervous laugh. She smiled to disguise the awkwardness of the moment. Taro was not the only one in the group unprepared for their initial meeting with a host family. Although they had studied the English language before their trip, the group lacked an understanding of its pragmatics and, in this case, the speech act of greetings. Greetings are one of the few speech acts that children are taught explicitly in their native language (Kakiuchi 2005). Yet, the communicative function that greetings serve is usually understood as subordinate to other purposes in the ultimate goal of communication (DuFon 1999). In the language classroom, this subordinate position often means that teaching greetings is neglected; too little attention is paid to the roles that greetings play in various cultures and how these roles may affect the ultimate goal of communication. This article will provide background information on this important speech act and instructional strategies for use in the classroom to help teachers equip their students with a critical component to successful interactions.This article also describes four awareness-raising tasks that introduce the greeting speech act as a cycle of explicit pragmatic instruction, including keeping a greeting journal, watching contemporary TV shows, using discourse completion tasks (DCTs), and participating in role plays and mingles. Being able to speak naturally and appropriately with others in a variety of situations is an important goal for many English as a foreign language (EFL) learners. Because the skill of speaking invariably involves interaction with people and using language to reach objectives (e.g., ordering food, making friends, asking for favors), it is crucial for teachers to explore activities that help students learn the typical ways to express these and other language functions. To interact successfully in myriad contexts and with many different speakers, learners need to develop a repertoire of practical situation-dependent communicative choices. The study of how language is used in interactions is called pragmatics, and while appropriate interactions come naturally to native speakers of a language, EFL learners need to be aware of the many linguistic and strategic options available to them in certain situations. Though pragmatics is an extensive field within linguistics, much pragmatic research has focused on speech acts performed by learners and the linguistic and strategic choices they employ (Mitchell, Myles, and Marsden 2013). To use pragmatically appropriate speech, EFL users must account for not only the form and function of a second language, but the context as well (Taguchi 2015). In doing so, they will be more comfortable speaking to interlocutors who may vary in age, gender, social class, and status (Kinginger and Farrell 2004; Ishihara and Cohen 2010). Special conversational choices are also required based on the relationship between speakers—whether they know each other and for how long. In addition, conversational expectationsand desired objectives can influence linguistic and strategic choices of what to say. The ability to account for and adjust to these variables when speaking English defines one’s pragmatic competence. Despite its importance in EFL communication, the teaching of pragmatics is often overlooked in the classroom and underrepresented in teaching materials and teacher education courses. Reasons include insufficient class time, lack of interest, or inadequate recognition of its importance in interpersonal communication. There may also be a shortage of practical and achievable activities for the classroom that introduce and promote the development of such nuanced language use. While teachers may recognize the importance of pragmatics and want to use it in their lessons, many are unsure how to select and incorporate pragmatic teaching activities in EFL classes. This seems to be the case in Japan, where I teach, and I suspect the situation is similar in other EFL contexts. The purpose of this article is to demonstrate how to identify pragmatic teaching points, to introduce related activities, and to generally encourage attention to pragmatic speaking ability in language classrooms. This article promotes the idea that pragmatic skills identified and developed in EFL settings contribute to communicative success. It begins by discussing pragmatics as a general field within EFL education before moving on to present the notion of speech act sets (SASs), which are step-by-step conversational options normally used to successfully communicate a variety of language functions. SASs are considered valuable tools for examining language and strategic choices made during speech production, and they also provide useful templates for language teachers who want to add a pragmatic element to their speaking lessons; as such, the concept of SASs is promoted in the literature in an effort to advance pragmatic studies through a speech act perspective (Ishihara and Cohen 2010). Through comparisons of student output from two SASs for the language functions of apologizing and requesting, this article demonstrates how to identify specific pragmatic teaching points and use them to inform pragmatic instruction. This article also suggests classroom activities that teachers can use to help learners develop and refine their pragmatic abilities in English. Going public with our research is an important part of the research process. Besides the intrinsic value of sharing our experience and our insights with a community of peers, in higher education, publishing is vital for job security and promotion. Despite these forces encouraging us to publish, few academics actually do. Reports from all over the world reveal that the publication rate among scholars is low. Academics in South Africa and Australia, for example, publish an average of 0.4 articles per year (Gevers 2006; McGrail, Rickard, and Jones 2006). The importance of publication compared to the relatively small numbers of teachers and scholars who publish, however, is an issue not only for tenure-track professors at universities; kindergarten through twelfth-grade (K–12) teachers of English as a foreign language (EFL), EFL administrators, and TESOL (Teachers of English to Speakers of Other Languages) professionals have experience and ideas that could be more broadly shared in outlets from newsletters to academic research journals. Researchers have identified a number of explanations for why publication rates are so low, including time constraints, inadequate skills, and lack of institutional support. Among academics for whom English is an additional language, the challenges of writing for publication are even more complex (Benfield and Feak 2006; Uzuner 2008). English as an additional language (EAL) students and academics face difficulties because of unfamiliarity with genre patterns and the structure of articles in English journals that are generated in cultural contexts different from their own (Hyland 2003). EAL scholars must learn the unwritten “rules of the [publishing] game” as it is played in academic journals of the English-speaking world (Gosden 1992, 136). The purpose of this article is to provide an introduction to identifying the hidden rules and explicating the sometimes intimidating world of publishing. It focuses on the journal article genre, but the insights and advice are useful for teachers and scholars both inside and outside the university. For example, K–12 teachers who wish to share lessons from their classroom experience or EFL administrators who want to publish their observations and practical solutions will find helpful suggestions. The article presents a tool for teaching about publishing in a way that can benefit teachers and scholars who are interested in getting their ideas into print. It will assist younger academics who have never published before and will serve as a refresher course for senior academics who have already published. The article begins with an overview of the literature on obstacles to writing that academics face. We then offer ten practical tips for overcoming these barriers in order to get articles published. Have you heard of pragmatics before? What does it mean? What are some examples of pragmatics when using English? What might be some examples of pragmatic “mistakes”? Can you think of a verbal or nonverbal pragmatic mistake you have made when speaking English or your native language? If you were in the same situation again, what, if anything, would you do or say differently? Think of the standard greetings (verbal and nonverbal) in your native language. How are they similar to or different from the greetings discussed in this article? Would your students potentially make mistakes with any of these greetings in English? Which techniques from this article would you use to help your students make these greetings in English? In the section called “Task 3: Using discourse completion tasks (DCTs),” the author provides several situations that can prompt students to practice English in various social contexts. Can you think of other situations, perhaps at your school, that would work well for discourse completion tasks? Try writing some and using them with your students. The author recommends asking students to keep greeting journals. Before you do that, try keeping a greeting journal yourself for a week.What does keeping the journal help you notice? What might you tell your students about your experience before you give the greeting- journal assignment to them? Imagine that you are at a meeting at school. Your supervisor makes an announcement that worries you. What do you say in the meeting? What do you say to a coworker after the meeting? How are the things you say in each situation the same? How are they different? You are going to explain to a friend how to make a special kind of food from your country.Which would be easier, explaining how to make it in your friend’s kitchen or explaining over the phone? Why? Which would require more detail and explanation? Why? You need to make a request to a colleague at school.What do you say to get the colleague to agree? How do you say it? Think of things such as words, phrases, idioms and other expressions, and intonation. Look at the speech act set (SAS) for apologizing in Figure 1 on page 14. Imagine that you borrowed a coworker’s book and spilled coffee on it by mistake. How do you apologize? Use the SAS to write an apology. What are some good attention getters for apologizing? For requesting? Write two lists. What is a softener? Why are softeners important? What are some good softeners for apologizing? Look at the SAS for requesting in Figure 1 on page 14.Which parts of it are easiest for your students? Which parts are hardest? Why? How can you help your students learn to make effective requests? What English language teaching journals and publications do you like to read? Have you ever written an article for publication? If yes, describe your experience in a few sentences.What did you learn from your experience? What would you do differently next time? Do you want to write something for publication? Why or why not? What questions do you have about how to get your ideas published? Imagine you are going to write an article (or a Teaching Technique) for English Teaching Forum.What successful English teaching experience, special knowledge, or expertise do you have to share with other teachers? Brainstorm a list of ideas and topics that you could use in an article. You might check the English Teaching Forum submission guidelines (americanenglish. state.gov/submission-guidelines) to help you think of ideas. Are any of the factors discussed in the article holding you back from writing for publication?Which ones?What suggestions in the article can help you move forward? After having success with this warm-up activity in my theater classes, I adapted it for my beginner-level English classes, knowing my students would appreciate the opportunity to move around. The activity allows students to create their own physical interpretation of a vocabulary word, which increases their ability to remember it (Asher 1996). I introduce the activity with a class and then use it frequently as a warm-up to review vocabulary. The activity requires little preparation and few materials: just something to play music with and cards for introducing vocabulary terms. Best of all, the activity incorporates movement in a way that is easy for students to understand. The entire class walks in a circle throughout the activity. Each student changes the nature of his or her walk (rhythm, gait, pace, etc.) in response to vocabulary prompts. The activity is best suited to beginner classes in which students are learning basic vocabulary, but both older and younger students enjoy the activity. And, while the activity is easiest to use in classes with fewer than 30 students, it can be adapted to larger classes by having one group walk at a time, with the other groups taking turns calling out the prompts. Because this type of physical activity may be unusual for some students, allow them to acclimate to using movement in the classroom. I recommend using music. Moving to music comes naturally to most learners. Try to play four or five genres with different tempos; choices can range from somnolent background music to something more energetic, like punk rock or heavy metal. You don’t need to play an entire song—just enough to allow the students to react to it. For this activity, lyrics are not important, as students will be responding only to the music. The Free Music Archive (freemusicarchive. org) has music in nearly every genre imaginable, available for play or download. Arrange the desks or chairs in a large circle, or, if the classroom is small, push them to the walls to make space in the middle of the classroom. Keep in mind that the students will have to return to their seats during the class, so the desks should be out of the way but still accessible. Write the words walk, listen, and show on the board. Ask the students what walk and listen mean. If they can’t explain, ask them to show each action by pointing to the word show on the board. If no one knows these words, demonstrate each of them yourself while repeating the word. To check comprehension, repeat the word and ask students to demonstrate (that is, “show”) the meaning. Encourage students to “show” you the word rather than calling out a translation. After students understand the concept, ask them to form a circle in the middle of the room. Say “Walk,” point to the word walk on the board, and motion for the students to walk in a circle. Then say “Listen,” point to the word listen, and play a relaxing song. Now, ask the students to “show.” Demonstrate by joining the circle and walking with the rhythm of the music, swaying, using your hands or doing anything you like, but continue to walk in a circle. Encourage the students to do the same. After they have found their rhythm, change the genre of music and encourage the students to move differently. Start from slower selections and move to faster tempos. While there may be a little embarrassment at first, students should overcome their hesitation when they realize they are moving more as a group responding to the music than as individuals. Adolescents, in particular, may be reluctant to “show” the music. You can deal with this reluctance by asking students a few days before about their favorite music. Usually when they hear familiar selections, they are more inclined to “show” the music. It is best to limit this activity to around five songs; about 30 seconds per song is sufficient. After students have “shown” you a sufficient variety of music, have them return to their seats. With students seated, show them a card, point to the picture, say the word (for example, “cold”), and then point to the word show on the board. Show “cold” to students by wrapping your arms around your body and shivering. Say the word while you show it. Present more cards, again saying each word and pantomiming an action; then go back to your card for cold and ask the students to show the word. Let them look at the picture and react. They don’t have to repeat the word yet. Continue in this way until the students have “shown” all the adjectives. Return to the board and write say. Hold up the cold card again, say “Cold,” and then point to the word say and repeat “Cold.” Gesture for students to say it as well. Then point to show again and pantomime shivering. Gesture for students to do the same. Start from the beginning with the cards. Go through them one at a time. This time, students say the word and show it. If students forget to “say” or “show,” point to those words on the board. Because one goal of this activity is to allow students to find their own physical understanding of the adjectives, encourage them to show the words in their own way. If you have a particularly expressive class, consider letting them show all the words without help after you provide the first example. After students have demonstrated their understanding, have them return to the middle of the classroom. Point to the word walk on the board and pantomime the action so students will know to walk in a circle. Now, instead of playing music, you can hold the cards up and call out each word while pointing to show on the board. As students walk in a circle, they must “show” the adjective. Most of them will naturally incorporate this into their walk, but if they are having a difficult time, demonstrate how their walk would adjust to the adjective. If you feel comfortable, give a theatrical performance of someone walking in a frigid blizzard for cold, but allow students to interpret the other adjectives on their own. Instruct students to say the words as they show them by pointing to say on the board again if necessary. Remember to reorder your cards so you are not reading them in the same order every time. After students feel comfortable with the activity, you can change the length of the pause between cards so that students have to quickly change the way they are walking. You could also call out two adjectives at once so that the students have to try to show them simultaneously (which is always funny). Initially, this activity can be limited by students’ experience. That is why I recommend starting with the simple weather vocabulary. Students may have never experienced cold weather, but they usually know how to show it. They may not have any idea how to show concepts such as “humid” even if they understand them. In exploring these concepts by relating them to known vocabulary, students find ways to respond to vocabulary that is more complex. Humid, for example, could be shown as a combination of wet and hot, once those terms are understood. After the initial class, I continue to use this activity as a warm-up to review the previous lesson’s vocabulary. If the class learns other weather adjectives, the students find ways to show the new words like misty or icy. The activity helps students explore and personalize many beginner vocabulary sets. For example, “feelings” vocabulary sets are also easily shown. The reason I don’t start with feelings is that the whole body reacts to weather, but when I have started with feelings, students have had a hard time giving more than facial expressions. For “rooms in the house” vocabulary, students can show what they do in each room, and the same approach can be used for “places around town.” Rather than physically reacting to a command (“Stand up,” “Sit down,” etc. ), students are reacting to their interpretation of a concept. As a result, vocabulary sets related to family members, food items, clothing, and even colors can be used (see the suggestions below). As a warm-up, this activity serves the functions of refreshing students’ knowledge of a word and allowing them to have fun interacting with it. Encourage them to interpret each term for themselves when they “show” it. If students feel that they are only copying the teacher or other students, the activity ceases to be enjoyable. As long as students feel free to react personally to the word, they will continue to enjoy the activity. Clothing. Sweaters are heavy; formal clothes are stiff; casual clothes are loose; footwear changes the way students walk (everyone loves showing high heels or a “slippers shuffle”). With less obvious articles of clothing like hats and socks, students can pantomime putting them on or adjusting them. Family members. Students usually agree on universals such as mothers hold babies, sons jump around, daughters skip, fathers have a dignified walk, grandparents hobble, and aunts and uncles take on idiosyncratic actions (ask students about their aunts and uncles to discover these characteristics). Rooms in a house. This topic is usually appropriate to include after students have learned common action terms such as eat, sleep, drink, read, and watch TV. Students pantomime each action depending on what they usually do in each room: they watch TV in the living room, eat in the dining room, and sleep in their bedroom. The garage usually suggests a driving pantomime; for basements, students start at full height and “walk downstairs,” bending their knees as they go. Colors. It is important to have already studied feelings before using colors in this activity because the two are linked. Students determine for themselves how certain colors make them feel. I ask them this and write feelings on the board next to each color in a mind- map cloud. After we have explored the emotional range of each color, students walk and show these colors. Food. Students respond to food items usually by showing a pleased or disgusted overall appearance, varying in terms of severity. I introduce the scale of preference (hate, dislike, like, love, etc.) as part of this lesson, and students explore in advance ways of showing varying degrees of preference for food items. Asher, J. 1996. Learning another language through actions. 5th ed. Los Gatos, CA: Sky Oak Productions. Jonathan Maiullo began teaching English to Sudanese and Afghan refugees while an undergraduate at Michigan State University. As a Master’s International student, he volunteered as an English teacher-trainer in Yeghegnadzor, Armenia, with the Peace Corps. “Give or Take?” is a fun game that teachers can use to review vocabulary in the English as a second language or foreign language (ESL/ EFL) classroom.This game is easy to prepare, and it is a fun and efficient way to review for quizzes or larger midterm or final exams. It can be adapted to almost any grade level or ESL/EFL classroom as long as there are a sufficient number of vocabulary items to review. In my experience, adults love playing this game as much as children do.While this game is not intended for new English language learners (ELLs), it may be used with low- to advanced-level ELLs as long as they have a basic understanding of the vocabulary being used. As with any game of competition, some caution is advised for using this game with young learners or learners with low maturity levels. The game takes about five minutes to prepare and can last for about 30 to 40 minutes.You will need a whiteboard and pens, a chalkboard and chalk, or a piece of paper big enough to be seen by all the players in the game and pens to write on it.You will also need one bell or noisemaker for each team, although when I have forgotten my noisemakers, I’ve substituted old dry-erase marker pens and instructed the students to tap them on the desks to make sounds. For environments with limited resources, recycled paper can be used, and students can raise their hands instead of making a sound. Yu Huang and Yu Zhu are senior high school English teachers at Hezhang County No. 2 Middle School in the province of Guizhou. In China, most middle schools consist of six grades of students; the first three years are considered junior middle school and the latter three years are commonly referred to as senior middle school (or sometimes senior high school). Both Ms. Huang and Ms. Zhu are dedicated to helping their students build interest in the English language inside and outside the classroom. They work diligently to increase their students’ confidence and give them access to more opportunities. For both of these women, communication and professional development are paramount to forming productive relationships with other teachers and the students—which leads to success in language learning. Despite the challenges in Hezhang, Ms. Huang and Ms. Zhu have both chosen to work in their hometown. With highly qualified teachers flocking to the international metropolises of Beijing, Shanghai, and Guangzhou, more rural areas, like Guizhou province, are left with fewer educators. Ms. Huang had the opportunity to teach in her provincial capital city but turned it down in order to make a difference in her local community. “Everybody thought I should grasp the chance to work there, but at last, I chose to come back to No. 2 Middle School because I like the atmosphere here and I am used to the way we communicate with each other, and I have a family here,” said Ms. Huang. Specifically, she has become used to the way of communicating with other teachers, including Ms. Zhu. These two women met at No. 2 Middle School as workmates while grading student exam papers. Their work relationship developed into friendship when they discovered they shared the same passion for bettering themselves as teachers as well as empowering their students. “We found that we had many similarities, so we started to cooperate to improve our students’ English,” said Ms. Zhu. Another similarity these two teachers share is their educational background. Both Ms. Huang and Ms. Zhu studied English with the initial intention of finding a stable job. Ms. Huang was an English major at Guizhou University in the provincial capital of Guiyang from 2002 to 2006 and had dreams of working for an international company. Ms. Zhu studied at Bijie Normal School from 1999 to 2001. After teaching primary school for three years, she decided to go back for another two years of schooling at Guizhou Normal College in Guiyang from 2004 to 2006. In the end, both women decided that working with students was the perfect way to stay fresh. “Young people always have new ideas, and staying with them can help me keep a young state of mind,” said Ms. Huang. Although it is not unusual to find Ms. Huang and Ms. Zhu in the same classroom, it is unusual for Chinese senior high school teachers to co- teach. “We are the first partners in our school. We sometimes give class together,” said Ms. Huang. “I don’t know of any other teachers in our school who work together in the same way.” In order to provide more opportunities for their students, the two teachers spend an average of four hours per week planning together, co-teaching, assisting each other, and even exchanging classes. “We do not share an office, but we make time to meet together, sometimes at a coffee shop,” said Ms. Zhu. Ms. Huang and Ms. Zhu work together not only in the office, the classroom, and teacher trainings, but also after school hours with their own English club. They quickly realized that 40 minutes per day was simply not enough to accomplish their teaching goals and satisfy the needs of their students. For this reason, along with several other English teachers, they established the “Magic Life English Club.” The name was chosen by the student club members to highlight the power of English and its influence on one’s ability to travel, navigate the Internet, and live a life that may have seemed possible only in a fairy tale. The club was started less than one year ago, but it already has over 120 participants from the middle school attending regularly. Because the club is still in its infancy, the leaders hope that even more of the 3,657 students in their middle school will attend. The club meets at the school once every two weeks for at least an hour and is led by different groups of students each session. Ms. Huang and Ms. Zhu are there as organizers and facilitators. “The students enjoy being in control and having the chance to share their knowledge with their peers,” said Ms. Huang. For the two teachers, the English club is also the perfect environment for them to try out new strategies. “We tried the running dictation activity that we had learned about in one of our trainings,” said Ms. Zhu. “The students seemed to love it—all the members took part and were interested in the activity.” Running dictation is a fast-paced interactive strategy that integrates reading, writing, listening, and speaking. Typically, students are divided into several teams. Each team has “runners” and “writers.” The runners must go to various places around the classroom to read and memorize a small passage, which they will dictate to the writers. The teams compete to complete their passage first and also have the most accurate passage. Ms. Zhu reported, “With so many students in our club, it was difficult to control everyone during this activity.” So, it was back to the drawing board with Ms. Huang to problem- solve and find possible remedies. Another challenge that seems ubiquitous among Chinese teachers of English is getting students to speak more. Students’ oral competence is often connected to their confidence and self-image, so overcoming such fears among teenagers is not an easy task. However, Ms. Huang and Ms. Zhu persist in addressing this difficulty in creative ways; one such way is through music and singing. Ms. Huang’s proudest moment as a teacher was noticing the changes in one of her shiest students. At the beginning of the semester, the student timidly muttered the “ABCs” in front of her peers, but by the end, she confidently sang a multi-verse song for the whole class. Ms. Zhu also likes to use music in her classroom. “I use websites, like www.songlyrics.com or www.lyrster.com, to find song lyrics which are appropriate for the lessons I am teaching,” she said. Problem-solving and creativity go a long way in the classroom; so, too, do relationships. Both teachers emphasize the importance of building strong relationships with their students and colleagues by spending time genuinely getting to know others. For example, Ms. Zhu creates an inventory for all her students to fill out on the first day of class so that she can learn more about them and know how to contact them outside the classroom. She typically asks them about their family members, hobbies, dreams and goals, preferred learning styles and habits, email address, and other social media contact information. Likewise, Ms. Huang spends time before and after class talking to her students one-on-one to understand more about their dreams and desires. “I like to talk with them. First, I will be their friend, and then I will be their teacher next,” she said. Both Ms. Huang and Ms. Zhu want their students to use English as a universal language to communicate and access more information and opportunities. They accomplish this goal by cooperating and by communicating openly with each other, their colleagues, and their students. Most importantly, they recognize the importance of professionalism and continuing education. Ms. Huang recently found out that she has been selected by the Chinese national government to participate in a summer exchange program at Georgetown University later this year. She plans to use this opportunity to strengthen her own skills as a teacher and then share them with others through teacher- training workshops. “My goal for this next year is to spread ideas to other teachers—first teachers in my school, and then in my county. I could be a trainer next year,” said Ms. Huang. Already one teacher is inspired by Ms. Huang’s work. “She is my hero,” said Ms. Zhu. This article was written by Rebekah Gordon, an English language teacher who is currently serving as a renewing English Language Fellow hosted by Southwest University in Chongqing, China. OVERVIEW: This activity will allow students to practice using greetings by creating a brief skit. Students should be familiar with common greetings and know whether they are considered formal or informal. Students should also understand appropriate register, meaning the use of language that is suitable in particular social situations. Creating a skit can be a useful practice activity for students from varying proficiency levels, especially when addressing pragmatics. The procedures outlined below make the task accessible to beginning-level students, but the variations can offer more advanced students a challenge. PREPARATION: Find two containers that can be used as “grab bags” for students to draw from. Cut paper into strips, sized so that you can write one word or phrase on each strip. You can use either two different colors of paper or two different colors of markers or pens. Ask students to help you brainstorm a list of formal and informal greetings as a warm-up for the activity. If necessary, remind students of the difference between formal and informal greetings by saying, “Remember that formal greetings are those you would use when speaking to someone older or to an important person in the community such as an elder or a professor. Informal greetings are those you would use with friends or close family members. Think about the different ways you can greet these types of people.” If students need assistance, you can start the list by providing an example of each type of greeting, such as “Hey” for informal and “Good afternoon” for formal. Note: Be sure that you create enough slips with types of people on them for your whole class. For the skit, each group will draw three slips from the “grab bag” of people, so you may need to create multiples of some types of people in order to have enough slips. For example, you might have three slips with judge, three slips with grandmother, etc. Create slips for the places the same way as you did for the people in Steps 2 and 3, but use a different color of paper or different color ink. 5. When all of the ideas about people and places have been written on slips of paper, create two grab bags using the containers. Attach a label to each container, marking one “people” and the other “places.” Students can assist you by folding each slip of paper and putting it into the appropriate container. 6. Let your class know that you will show them an example of how the activity will work. Ask for three volunteers to act as your group members for the explanation. Then, choose three slips of paper from the “people” container and one from the “places” container. Write the people and the place on the board so that students can see them. • How would I greet this person? • Can I speak to them the same way I would my friends at school? • Do I need to speak to them in a different way? Try to get the class to give you ideas about exactly what greetings they would use for each person.Write these on the board under the names of the people. 8. Once you have discussed each of the people and written some ideas, model how to act out a scenario in the place you chose. Assign each volunteer one of the people drawn from the container and explain that the volunteers will have to act out those roles during the skit. You can even create a sign for the students to wear or hold up, or write each student’s name next to his or her role on the board so the class will remember who that person is. Tell the volunteers that you will greet each of them as if you are meeting in the place that you have drawn from the container. For instance, if your place is the market, have the group members act as though they are carrying shopping bags and looking for items to buy. If the place is a coffee shop, students might be waiting in line to order or sitting at a table sipping coffee. 9. Act out a quick version of what the skit should look like by encountering each person individually and greeting him or her appropriately. Each student volunteer should respond by returning your greeting accordingly. They can get ideas from the list of formal and informal greetings on the board from Step 1 if needed. The purpose of this example is to model what students should do in the activity and to remind them to use formal and informal greetings appropriately. Once you have completed your fast example, give students time to ask any questions they may have, and offer any further explanation you think is necessary. 10. Inform students that they will be working in groups of four. You can use any method to group your students, or allow them to choose the classmates they will work with. 12. Once the students are in groups of four, they will need to choose their people and their place for the skit from the containers. This is probably easiest if each group selects one representative to go to the front of the classroom to make the selections and then return to the group. 14. At this point, circulate around the room and listen to the groups’ discussions. Answer any questions students may have, or offer assistance if they need it. 16. Give students time to plan and rehearse their skits. They can write a script if they find it helpful, or if you want to have a written assignment to use for grading purposes. Otherwise, students can perform the skit from memory. Again, move around the room to help groups that need assistance. 18. Write on the board: Did you think the greetings you heard were good ones to use with the people in the skit? If yes, why? If no, what greetings would you use? Explain these questions to students, and model how to give feedback to their classmates by saying: “For example, I watch a skit where someone greets the principal of our school at the market by saying, ‘Hey, Principal Rousso, what’s up?’ I do not think this is the right greeting, so I would tell the group, ‘I think that you should use a more formal greeting to say hello to the principal,’ and give my idea for something different to say.” You can also have students write the questions, give a written response to each one, and then hand in their papers at the end of the activity. Or, you could have students use a checklist (see Extensions) to give the groups feedback on their skits. 19. Once all the groups have had time to plan and practice their skits, they can present them in a variety of ways. Depending on the size of your class, one option is to have each group of students present to the whole classroom. Or, if you have a large class, you can split the class in half and have each group present to its half of the class. Another option would be to pair groups and have them present to each other. Depending on how the groups present their skits and how you ask students to provide feedback, you can monitor the presentations and also participate in the discussions. Provide a checklist (as mentioned in Step 18) for students to use to assess and give feedback to their peers. Here is an example that you can write on the board for students to copy and use during the activity. If you want to extend this activity, the feedback students give to each group about their skit can play a bigger role. Groups who received suggestions about how to change their skit can use the feedback to make changes and improve their work. If some groups received only positive feedback, they could choose another set of people and a different place to plan a new skit.Then, all the groups can present again, showing either their improved skit or a new one. This activity also allows for some repetition to give students more opportunities to practice and reinforce their skills. For example, groups could keep the same people in their skit but change the location by drawing a different place from the container. Groups can also repeat the process with a different speech act or a different group of four students from the class. As students learn more ways of interacting, they can continue their skit. Because the original activity focuses on greetings, there are many possibilities for adding to the dialogue. If students work in the same groups, with the same people and place, they can add more speech acts to form a full conversational exchange. For example, after students learn about making introductions, they can practice introducing a friend to each of the individuals in the skit. Of course, this will require that students take on multiple roles by acting as the friend when they are not the person greeting or being greeted. Once students learn different ways to end a conversation and say good-bye, they can continue by adding a closing to the interaction. Any of the speech acts listed above in Variations, or others your students are learning, can be used to continue the skit and give students additional practice with using appropriate register in different situations. This activity was written by Amy Hanna, who has taught ESL to students in primary school, university, and adult education classrooms, trained teachers in TESL methods, and developed materials for English language programs in the United States and abroad.